Interns work on Earthship construction sites where it is necessary to assist the crew. The exact content of the work varies from session to session. Work hours are Monday through Friday from 9:00 am to 4:30 pm. This work is labor intensive, but we are happy to work around any physical issues you may have. No prior building experience is necessary and we encourage people of all ages and backgrounds to participate. Please note this Internship is not a course on how to build an Earthship. If that is your interest, then you should attend the Earthship Academy. The fee for attending our three week session is $500. This price includes a shared room (usually with one other person, sometimes two), a class on the Earthship 6 Principles and a Tour of the Earthship Community. If you would like to upgrade to a private room, you may do so by paying an additional $100. If you are coming with a friend, the total cost will be $800 for both. We offer very basic, dormitory-style housing to interns and students. The accommodations include early Earthship attempts, Earthship-inspired buildings, and our latest Simple Survival models. These spaces are rustic and experimental, and you must be prepared for camping-like conditions. There are no laundry facilities on these sites. We have set the prices of these accommodations to be lower than equivalent transient around the Taos, New Mexico area. Some of the water and power systems of these buildings are designed for minimal use only, not for ideal comfort. A $100 cleaning deposit is required for check-in to any Intern housing. This money must be in the form of cash or check and will be collected at Orientation. This money will be returned to you upon your departure pending the cleanliness of your space. If you need to leave before the scheduled check-out, your deposit will be returned to you via US mail or PayPal. We are unable to accommodate early check-ins or late check-outs. Taos, New Mexico is a high desert with an extreme climate. Temperatures can vary from 100 plus degrees in the summer to 30 degrees below zero in the winter. The elevation is 6,950 feet above sea level which can cause temperature variations of 40 degrees in a matter of minutes. Taos is seated at the foot of the Sangre de Cristo Mountains and is famous for it’s fine art, great food and majestic beauty. Taos Ski Valley is known as one of the best in the country and the Taos Pueblo contains the oldest stand alone dwelling in the United States. During the summer, Taos offers a multitude of outdoor activities including river rafting, mountain climbing and hiking. Natural hot springs dot the Rio Grande river and are not far from the Earthship community. There is no public transportation, Uber or Taxi service in Taos. Please take this into consideration when making your travel arrangements. The Earthship compounds, job sites and the town of Taos (food shopping, laundry facilities, gas, etc.) are spread out and driving is a must. If you choose to participate without a vehicle, you will be dependent upon your fellow Interns for rides. The closest airport is in Santa Fe, NM (1.5 hour drive). The closest International Airport is in Albuquerque, NM (3 hour drive to Taos). There are two airport shuttle services that can bring you to Taos, the Taos Ski Valley Shuttle: http://www.skitaos.com/discover-taos/airport-shuttle/ or Mario: 575-779-4424. Reservations must be made in advance. One month prior to each session, Interns receive a list of fellow participants and their email addresses so that they may coordinate ride sharing, etc. Orientation and check-in to the housing begins at 10:00 am on the first morning of each Intern session. This means you will most likely need to be in Taos the night before. We are unable to accept early check-ins and therefore recommend the Abominable Snow Mansion Hostel in Arroyo Seco: www.snowmansion.com as an inexpensive option. Check-out is at 2:00 pm on the last day of each Intern session. If you need to leave early, your cleaning deposit will be mailed to you upon the cleanliness of your space. Make sure you have read and understand the above information. 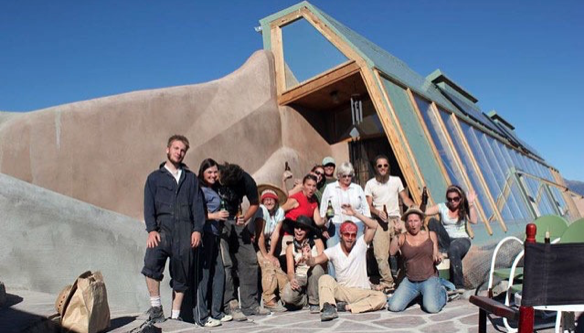 You can call our office at +1 575-613-4888 or send an email to internship@earthship.com. We will send you a PayPal invoice or you can send us a check or money order for your payment. Your spot will not be reserved until we have received your payment. PLEASE NOTE THIS PAYMENT IS NON-REFUNDABLE. Your credit will be honored for two years. Once registered, you will receive PDF packet with more detailed information about the session and Taos.